The Samsung PN58C550 58 inch flat panel Plasma HDTV features 1080p Full HD picture performance that is a perfect fit for most rooms. The attractive Touch of Color design adds a subtle clear-to-charcoal gray accent to the set's bezel. Enjoy brilliant, film-like images in Full HD resolution. Samsung's Series 5 breakthrough mega dynamic contrast ratio offers a more accurate color tonal range, deeper blacks and shadow details. The Samsung pn58c550 plasma tv also has 4 advanced HDMI inputs with Samsung's Anynet+ technology making system control of compatible A/V devices like a Blu-ray players or HTIB systems a one-touch operation. 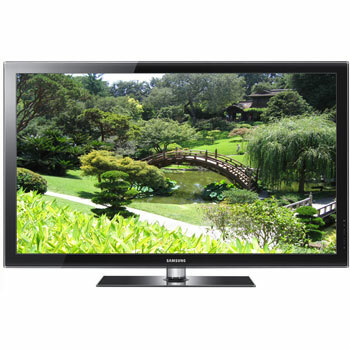 Enjoy Full 1080p HD performance on Samsung's PN58C550 plasma HDTV.